GREEN BAY, Wisc. — From where Mike McCarthy is sitting, on a bench and under a tent by the Packers’ practice fields, he could turn left, look over a fence and see Lombardi Avenue. Holmgren Way is right in front of him, beyond a set of stands. And now, McCarthy has one of his own—to his right, the former Potts Avenue, renamed Mike McCarthy Way in 2014. Heady stuff? Sure it is. Vince Lombardi turned the Packers into one of the league’s flagship franchises in the ’60s, and Mike Holmgren restored that greatness in the ’90s. Now, here’s what you might not realize: McCarthy actually has been in Green Bay for considerably longer than either of those two legends. (Lombardi coached the Packers for nine seasons; Holmgren seven.) What’s more, if it’s up to him, he won’t be leaving anytime soon. 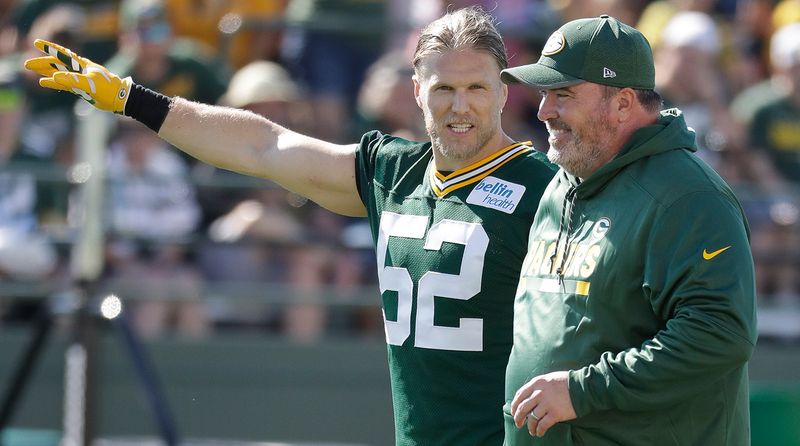 Having veterans like Clay Matthews in place has helped Mike McCarthy maintain a consistent culture in Green Bay. Late Raiders patriarch Al Davis used to say that coaches have a shelf life of 10 years in one place, before their message grows stale and their voice loses its effect. When Bill Walsh left the Niners in 1988, after three titles and 10 seasons, Walsh reiterated that sentiment. McCarthy, now at 12 years, isn’t buying it. And it’s not that he thinks Davis or Walsh were full of it. No, McCarthy sees it as something that came into focus for him when he sat down with ex-Steelers coach Bill Cowher earlier this year—times have simply changed. There are five teams with second-decade coaches going into this season—Green Bay, Cincinnati, New England, Pittsburgh and New Orleans—and Baltimore’s John Harbaugh will make that number six at the end of it. The guy with the longest run, Bill Belichick, is coming off his fifth Super Bowl title and going into Year 18. “In 1998, when Marty Schottenheimer stepped away from Kansas City, he just felt like 10 years, it was time for him to go,” McCarthy said. “But we had the same team. I was there for six of those years, and we had a high percentage of the same people. Since 2011, and really from Day 1 for me here, we have a 20-, 22-percent turnover on the roster every year. So my challenge isn’t as big as theirs was. 1. Be consistent but not formulaic. McCarthy says that while he’s more under control now than he was when he first was learning on the job, “going 100 miles an hour,” his routine is largely the same. But how he presents the result of it to his team is always evolving. 2. Lean on the players. One benefit of how the Packers have built under GM Ted Thompson—drafting, developing and keeping guys, and only sparingly adding outside veterans—is that McCarthy’s leaders are players who only know his program. Naturally, because those guys chose to stay past rookie deals and the team chose to keep them, they buy into it. Which makes them great salesmen. 3. Listen to the players. The biggest shift in the program over the past few years has been how attentive the staff has been to feedback, both internal and external, on setting up the schedule with the players’ well-being in mind. Not all of the tinkering has worked, but the guys trust McCarthy is always working at it. And knowing your coach is looking out for your performance, and by extension your career, counts. 4. Listen to the staff. The overarching idea, as McCarthy sees it, is for the coaching and scouting staffs to be a big think tank. In fact, he’s employed ideas in the past that he was iffy on because, “You gotta try things within your program to keep your people invested.” The charge is to be creative. The foundation won’t be overhauled, but needs constantly moved forward, and McCarthy believes in that coming from within. There are other elements, too. One came during OTAs when McCarthy invited the entire team to his house, split it into nine squads (he had shirts made up to ID them), and held a 10-event “Olympics,” with a 3-point shootout, a foul-shooting contest, longest-drive and 100-yard shot competition on the golf simulator, darts and even a dunk worked in. “We’re just trying to keep it fresh,” McCarthy says. And as for the results, they were never more clear than a year ago, when Rodgers’ numbers were down, the Packers were 4-6, and noise coming from the outside was reaching a fever pitch. McCarthy changed very little—the team was running three-hour practices at the time. Green Bay didn’t lose again until late January. For his part, McCarthy raves about the players he has—and says that last year’s team will go down as maybe his favorite, when all is said and done. That, in fact, is probably as good a piece of evidence as any that the end for McCarthy isn’t near. He got a response last year with the team’s back against the wall, and had as much fun coaching as he ever had. And in the back of his mind he’s thinking like Cowher once did—that he’s getting better along the way. Or at least the way this one does.